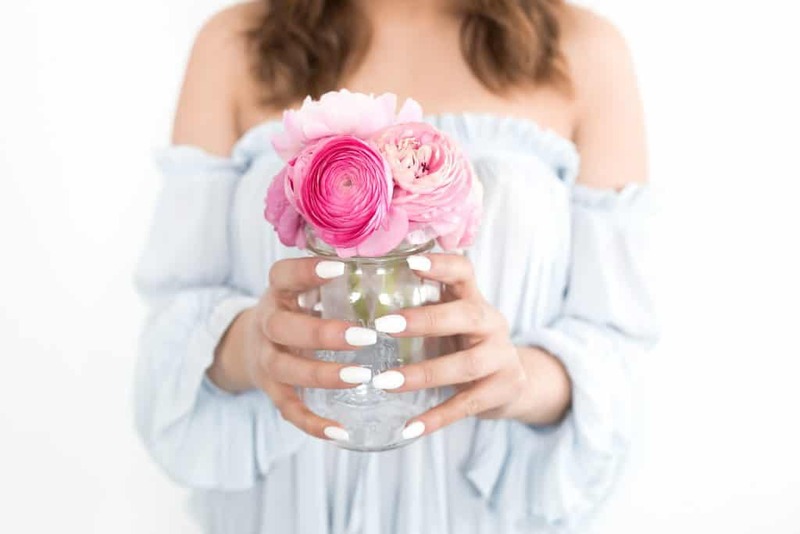 If I were to ask you right now, “What are you currently working on?” you’re most likely going to start ticking off on your fingers (and maybe toes) a long list of all the projects you’re currently working on, including those you “intend” to start working on. 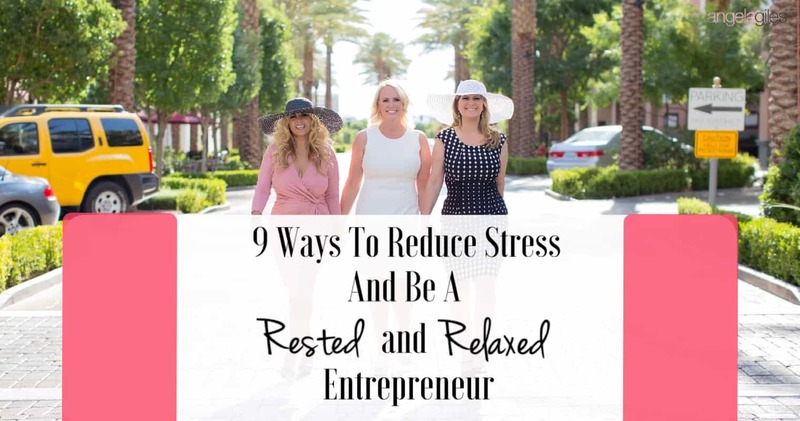 It likely won’t be a list of how to reduce stress as an entrepreneur. While there is no right or wrong answer to that question, you’ll notice most of us are probably focusing only on the big things and pushing the little things (which usually are what matters most) aside. I guess the latter questions would not be as readily answered as the first one. Why? Because everyone is busy chasing their careers and business. After all, being an entrepreneur is no child’s play. It involves lots of work! I think it’s time we look at things in a new perspective. It’s time we get our priorities right. We should make an effort to not drop the more important things while pursuing our passions. One of those important things is us, and reducing stress so we can keep going in our business, and to be there for those we love. Like me, you are probably also fascinated with the idea of creative chaos – you know, jumbled desks, half meals and sleepless nights; we even see it as something to be proud of. However, stress is never an accurate measure of success or productivity. While its possible to be busy, it’s equally possible to be busy doing nothing. Everyone agrees creative chaos means something worthwhile is happening, however, after a long while, those activities that result in creative chaos could actually end up stifling your creativity or totally causing a creative burnout. To survive and remain constantly creative, you need to set up a sustainable routine and life, for yourself first, then your business next. Take time to create a valve that lets out the pressure, that reduces stress. 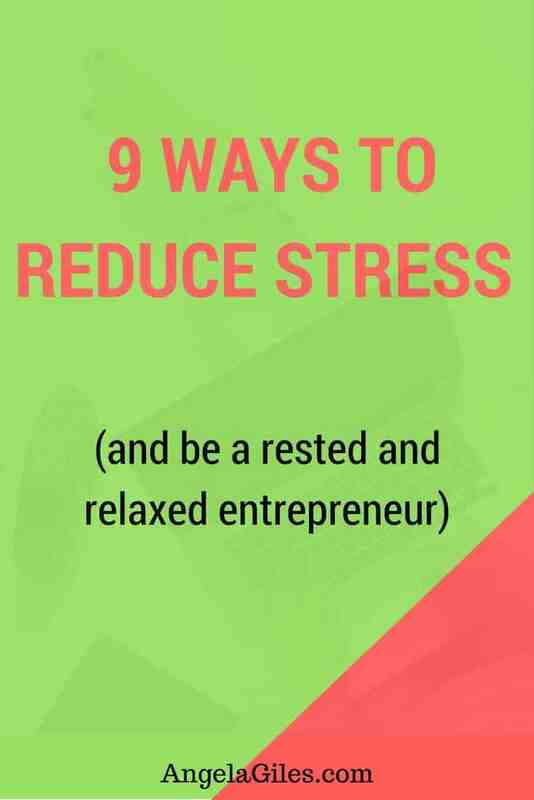 If you’re interested in having more of that “me time” that you deserve, which will also help to reduce stress as an entrepreneur, read on to learn some stress reduction tips that will help in achieving that. There must be some things you routinely do every day. It could be reading your emails before going to bed or watering your table plants after brushing your teeth in the morning. Whatever it is, let that guide you to create more structured routines that you adhere to daily. Routines help you reduce stress, relax, feel safe and give a sense of orderliness. It’s something you will need, especially as an entrepreneur whose life can be unpredictable most of the time. 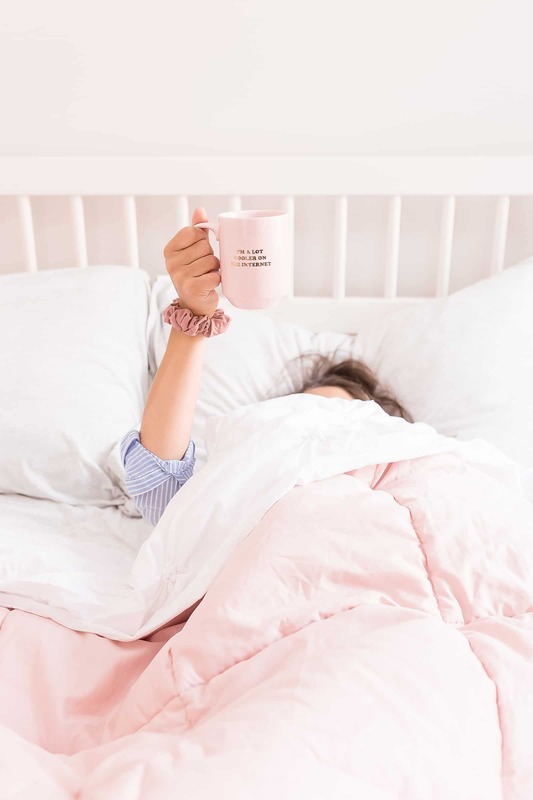 So think of those things you do when you wake up and those you do before going to bed, add or remove and make it your daily morning and nighttime routine. Even machines have a limit to how long they can continuously work. How much more do humans? Mother nature is such a beautiful (and sometimes annoying) thing, never presume though that you can cheat her. She gives you what you sow. Sow sleepless nights and reap losing clients and creativity. The body will always get what it was denied. Avoid going on short cuts with your sleep cycle because it will only hurt you and your business in the long run. One of the fastest routes to reducing stress is giving sleep its due. You might also want to look into supplements that could help you deal with stress because it could actually begin to affect your health, all you have to do is go to the doctor and ask, where to buy phenibut HCL or any other supplement that could help reduce stress. I have some friends who can get into bed and just close their eyes and just like that, they’re off to sleep. The people who belong to that group are very small though. For most of us, we first have a conference in our heads. Then we mentally travel around the world ten times before sleep then comes. And that’s if the sleep comes. Sometimes it can be elusive. Sack the guilt voice. Now that you’ve set out time to relax, that’s when your guilt voice simply sets up office in your head and begins saying things like, Someone might call, What if it’s urgent? Am I not actually wasting my time? Others are busy promoting their business, while I’m doing nothing. You do realize you own the property rights to the real estate of your mind, don’t you? So sack that guilt voice! Send it packing without notice. Deliberately create time for it. When filling up your calendar for the day or your To Do list, remember to include breaks and downtime to help you reduce stress for that day. 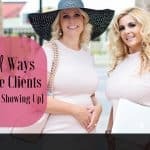 They are just as important as those meetings and events you fill up your calendar with. Chances are high you would actually relax during a time you have deliberately created (scheduled) for your downtime. Documenting the wasted time. You know those times you spend daydreaming? You can actually pick up a pen and document your thoughts during those periods so you don’t feel like you’ve wasted it. It can be personal journaling, or even writing business ideas down so you don’t forget them later. Sow the best seeds. What gets planted is what gets harvested. You can’t sow a pear and harvest an orange. You definitely are what you think, and what you think is what you feed your mind. Are you enriching your mind or poisoning it? Your downtime is the best time to reduce stress by taking up that book you bought ages ago and have never gone beyond chapter one, or to listen to that motivational podcast your colleague introduced to you. It’s the best time to sow the best seeds. Take power naps. For some, the word relax means sleep, which means at least 6 to 8 hours of sleep! Well, let’s take a lesson from our smartphones. You know when our smartphones appear to be misbehaving? Usually the first thing we do is reboot, and most times the phone becomes fine once again! This must be where the idea of this stress reduction technique called power naps came from. When you realize you can’t focus or you’re typing the same sentence and can’t find the comma button, just take that 15-minute power nap and the world will be alright again. The last thing you want when you’re on an inspiration high is to casually reach for your favorite colored pencil only to discover it ran out a few days back. That could really burst the creativity bubble. Some simple planning can help you avoid this. Keep your house stocked with items you know you always need (not just toilet paper and paper towels). Consider adding some other items in as well, you can always try ashwagandha amazon, or the Indian ginseng, as many find that helps with stress levels. It also really helps to keep your home clean and tidy. If you need to de-clutter by storing some belongings off-site, if you’re based in Australia you could check out self storage options from Holloway Storage. Keep a list of things you’re running low on so you know to add them to your shopping list before you run out. Many online stores make things even easier for you by allowing you to subscribe or auto-order those items you always need frequently. (Heck, you can even have heavy pet food automatically reordered.) And the best part is items are delivered at your doorstep, which also means less stress. Entrepreneurs frequently make the mistake of seeing their business as more important than their bodies or health. Those who fail to correct those mistakes end up paying dearly in the long run. Now you have an opportunity to avoid that pitfall, learn to be kind to your body and mind and do your best to reduce stress as much as possible. Resist the temptation to skip meals or workouts. Choose home-cooked meals over frequently eating out. (Yeah, I can hear your excuse… I don’t have the time to go shopping to cook my meals. I’m on the go a lot and take-out is faster.) I’m pleased to inform you that the current digital revolution has smartly wiped out your excuse! There are websites where you can conveniently take 10 minutes ordering all of the ingredients you need for meals you choose, and they’re delivered to your doorstep. And many grocery stores (including some big chains) deliver right to your kitchen counter! Even if you don’t save as much money as going to the grocery store yourself, it’s so worth it for the time and frustration saved not wandering aisles, standing in line, loading it all into the car and then unloading it all and carrying it inside when you get home. Those are smart ways to reduce stress. Cooking can also reduce stress while being an interesting and helpful way to relax your mind. To save time and thereby reduce stress when time to cook, wash fruits and veggies when you buy them so they’re ready to go when you are. If you have kids old enough to help cook, that can help save time and reduce stress as well. And yes, you may need a few sessions to help get them past the complaining stage (which certainly doesn’t reduce stress), but with effort you can get there. And the bonus is you’re spending quality time with your kids doing something together! Here are some tips to help maintain a healthy lifestyle and also reduce stress. Do Some Simple Exercise After Sitting for a While. If you notice you’ve been in the same position for over two hours, take a few minutes to stretch or do some simple exercises like lunges or jumping jacks. Even just touching your toes (or trying to!) or stretching your arms as high above your head as you can will help your whole body feel better. Remember to also do these stress reducing exercises during those TV commercials. Take a Power Nap in the Afternoon. Yes, it’s the power nap again. If your schedule keeps you constantly busy starting with your morning routine, by afternoon you may already feel tired. Good news! You must not wait until your nightly routine before you get some body recharging. Take a 15-minute power nap, 20 minutes tops, and wake up relaxed, refreshed and less stressed. With this short of a time there’s no need to worry about resetting your circadian clock and becoming awake at bedtime. Deliberately Plan for Unscheduled Free Time. Let’s assume you were supposed to be having a one-on-one coaching session and the client suddenly postpones the session ten minutes beforehand. That’s unscheduled free time for you. Yay! But what do you do with it? Many times we (humans in general) are not very good at doing anything useful when we have nothing to do. Now is the time to deliberately plan for that unscheduled free time. And please do not fill it with something like checking emails and Facebook. Better stress reducing and relaxing options are swimming (if you’ve got a pool at home,) yoga, meditation or even a brief walk. If you need to, post this list on your desk somewhere you can see it daily. Fortify Yourself With Morning Smoothies and On-the-Go Snacks. Starting your day with a smoothie is a great healthy practice. It’s a fast, simple and fun way to get those fruits in your fridge into you. It’s quick and can serve as a nutritious breakfast. Ever had that feeling of not being really hungry yet craving a bite of something light? A smoothie or other simple snacks (such as fruit or a protein bar) are perfect. Their nutritious value helps feed your brain and reduce stress as you get busy in the day. Save Time Spending One Night to Cook the Week’s Meals. Rather than spending a lot of time every day preparing your meals, especially if you want healthy home-cooked meals, trying cooking all you need for a week (or at least three or four days) in one night and then storing them in your fridge or freezer. This will help reduce stress when it’s time to cook. Stay Hydrated. Sometimes the reason you feel fatigued after spending hours working is because you’ve become dehydrated. So make sure your water bottle is full and close at hand. You can even make your own fruit-infused water the day before by putting sliced up fruit in it. But it doesn’t have to be water – choose anything (non-alcoholic) that makes you happy. Many people do not know that the chaos and clutter we have created physically can be a reflection of our state of mind. So if you’re wondering why it seems your brain is working extra time and making you feel so stressed, it may be that you’ve scattered it’s attention all directions. 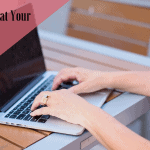 Get organized (your office, desk, laptop, inbox) and you’ll automatically feel much better. Plus, it can help reduce stress by lessening feelings of being overwhelmed. 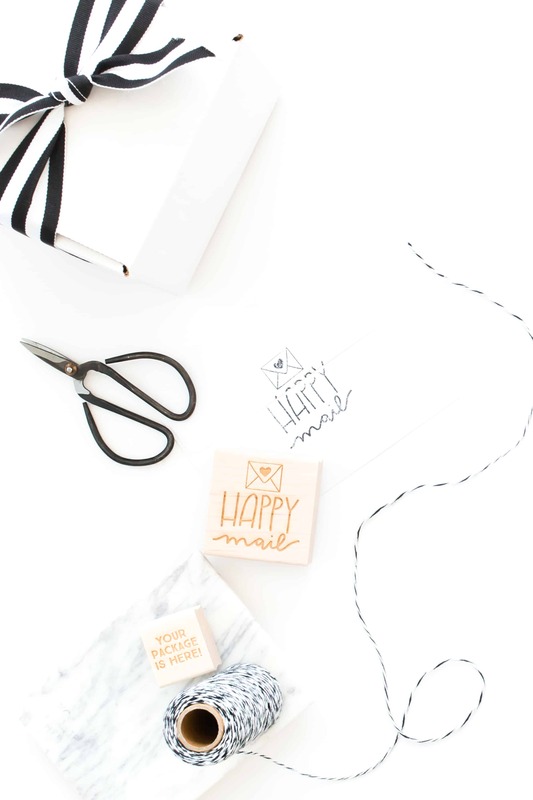 If getting organized has touched a cord in your heart but you’re feeling overwhelmed with all the mess you’ve got to deal with, or that keeps coming back after you make it go away, then practice the One Minute Rule to help stay decluttered and stay more organized. The One Minute Rule is really simple, and you probably heard it your whole life from your mom! It’s simply says “if it will only take you a minute, do it now.” Think about those tasks you can complete in under one minute as they come up, and start practicing doing them now rather than letting them pile up and then take hours to handle later. Here are just a few examples… 1) spend a minute discarding unwanted mail as it arrives so it doesn’t add to the “review weekly” pile, 2) when returning home, put your shoes and purse where they belong and hang up your jacket instead of throwing it over a chair, 3) put dirty dishes in the dishwasher right away instead of on the counter or in the sink, and a very helpful 4) before leaving a room you’ve been in a while (such as your office or bathroom for your morning routine), look around first and take one minute to put away anything not where it belongs. Making the One Minute Rule a habit will surprisingly go a long way in helping you live a less cluttered, more organized life, increase your productivity and of course reduce stress. Being an entrepreneur is one tight bottle of creativity, marketing and meeting deadlines. If you are one, you can understand how all of these pressures can make one feel bottled tight. Before you explode, you need to have a valve where you can let go of the pressure occasionally. Find some simple activities that take your mind off your daily grind while relaxing you. It can be taking a hot bath with a current novel you’re reading (especially when kids are at school and not constantly knocking asking questions through the door), doing a daily crossword or logic problem, a short stroll to a quiet area in the neighborhood to enjoy nature, or even just relaxing on the sofa listening to music. Research says that over 90% of humans do not breathe to their lung’s capacity, which is deep. This is usually the cited culprit for feeling dizzy and light headed, because shallow breaths mean low oxygen circulation, while deep breaths mean increased oxygen circulation. While everyone is already used to taking shallow regular breaths, occasionally, at several intervals in a day, take deliberate deep breaths. You know, the ones where you can see your lungs expand and feel like you can’t possibly take in any more air. Moreover, deep breathing is a popular mind relaxation technique. A relaxed mind will produce better ideas, innovations and decisions. If you need help with this, there are numerous apps out there that can guide you on your breathing deep journey. We’ve been talking about how you can have a less stressed life as an entrepreneur. It’s easy to get motivated for a few days after reading this and then incorporate most of the activities in your daily routine. But what happens after the thrill cools? Simple, include each of these activities in your timetable. 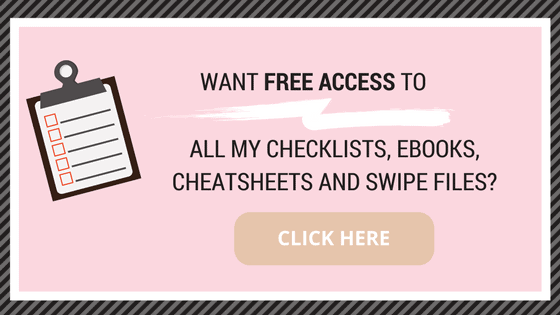 Schedule them the same way you would schedule that business meeting. Give them a high level of importance and position on your calendar. That way you’re more likely to take them seriously and actually do them! So just as you spend time trying to make your business successful, remember that you are important, too. The life of an entrepreneur is part work and part fun. Fun because most times we are turning a hobby into our main source of income. We should thus be careful of that thin line where our hobby becomes our work and our work becomes our hobby. Remember to practice all of these points and reduce stress as an entrepreneur. Don’t let your big dreams blind you from seeing the day-to-day little things that also matter. As you take care of those things, and take care of you, you will get a boost in your confidence to accomplish your big dreams of tomorrow. SHARE IN THE COMMENTS BELOW WHICH OF THESE WAYS TO REDUCE STRESS IS YOUR FAVORITE AND WHICH YOU’LL TRY FIRST.